On the beach, Andresla, leader of the Amazons, orders Donatello and Emur to surrender as prisoners. Don and Emur only want to rescue Leatherhead and know what country in the Hollow Earth they’ve landed in, but the Amazons are insistent on a battle. Don and Emur make a break for one of the winged horses, but the equine refuses to fly at their command. Andresla informs them that the horses haven’t flown in a long while, as they fear the strange crafts in the sky. Suddenly, a giant armored worm bursts out of the sand. Don and Emur leap onto its head and Don sends it packing with several stabs of his spear to its tender underbelly. Andresla is impressed by Don and Emur’s bravery and agrees to help them find their lost friend. Riding in the chariots, Andresla tells Don that the strange crafts come from a city called Darkuroz, one of the last outposts of the Atlanteans. Following a golden road, they believe they’ll find Leatherhead along the way. They do, though he doesn’t need any rescuing. 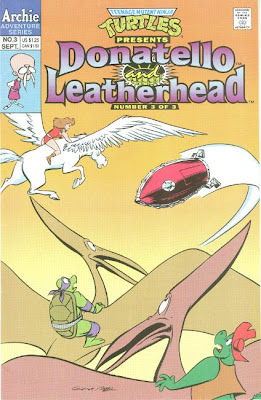 Leatherhead was able to speak to his pterodon “cousins” and convince them to help them in their journey. Spooked by a sudden earthquake, the flying horses take to the sky along with the pterodons and the heroes head for Darkuroz by air. They eventually find the El Dorado-like golden city, but they’re welcomed by several of the UFOs that brought them all to the Hollow Earth in the first place. Forcing them to land in the center of the city, Murtal steps out of one of the craft. Don and Leatherhead have had just about enough of this and demand answers. Murtal complies and removes his holographic disguise, revealing himself to be a lanky, bug-eyed creature. Murtal explains that he and the other Atlanteans accidentally destroyed their country ages ago during a military experiment. They fled to the Hollow Earth, as the radiation had mutated them into “alien” creatures. They then began kidnapping people throughout history in hopes of staving off their own loneliness, but their bizarre appearances kept them from interacting with other humans. Murtal kidnapped Donatello and Leatherhead after hearing of their exploits, believing that their ability to overcome their appearances in order to befriend humans could help them. 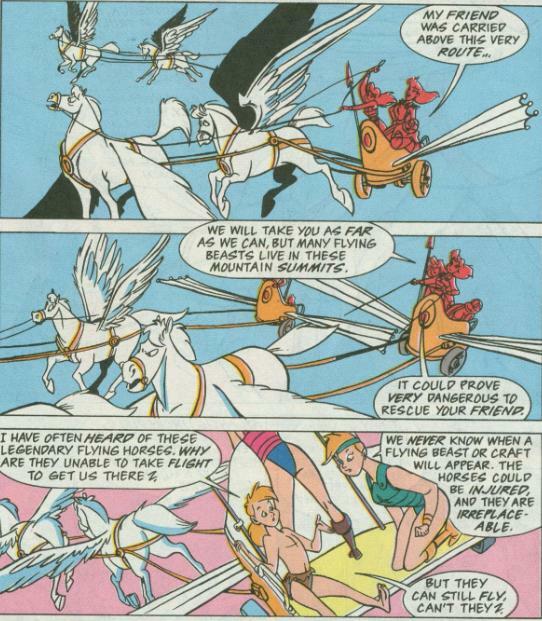 Andresla tells Murtal that she and the other Amazons would be happy to coexist with the Atlanteans so long as they shared their technology to help the people of the Hollow Earth live in peace. Murtal readily accepts her offer. Donatello tells Emur that he can return to the surface if he’d like, but he really thinks the boy has the potential to make a difference in the Hollow Earth. Emur decides that Don is right and agrees to stay, so long as Don and Leatherhead come back to visit every once and a while. Departing, Leatherhead watches the Amazons crowd around Emur and figures the kid won’t mind staying in the Hollow Earth one bit. The UFO then carries Don and Leatherhead back to the junkyard in New York where it originally took them, and at the precise moment it took them, too. Exiting the craft, Don and Leatherhead suddenly forget everything that had just happened, though Don has a strange urge to build a tunneling machine to explore the interior of the Earth. Just then, Michaelangelo comes by, telling them that supper is ready. *This story is continued from Donatello and Leatherhead #2. More Mutanimal crossovers will occur in Merdude and Michaelangelo #1. *Donatello’s next adventure will be in TMNT Adventures #46. *Leatherhead will appear again in TMNT Adventures #48, in the "Megadeath" back-up series. Well, it seemed the most interesting stuff got saved for the last issue, but at least there was some interesting stuff! Hey, look, Atlanteans! 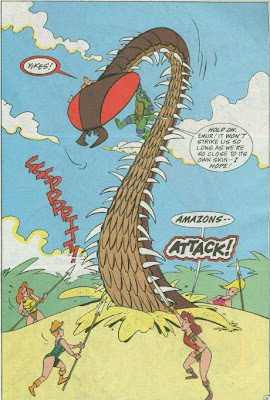 Not to confused with Merdude and his people, who were Atlanteans in the Fred Wolf cartoon but aren’t in the TMNT Adventures comic. Go figure. Anyhow, I sort of liked how this installment went crazy mish-mashing as many lost civilizations and cities as it could, from the Amazons to Atlantis to El Dorado, making for a rather fun trip. Unfortunately, as the concluding chapter, there isn’t a whole lot of payoff to it. Don and Emur join the Amazons without a fight. Leatherhead enlists the aid of the Pteradons without a fight. They arrive at Darkuroz and work things out with Murtal without a fight. Aside from the brief worm battle at the beginning and the earthquake, there just isn’t much suspense or even conflict in this chapter. One story point that kinda stuck in my craw was Murtal’s claim in the first issue that both Don and Leatherhead had once been human. I didn’t bring that up in my first review because I thought Murtal’s mistake about Don might come into play later in the story (also, I forgot), but here it’s brought up again and without correction. Don nudges Leatherhead slyly, indicating the fact seemed more directed at him, but Don never refutes Murtal's claim, making me wonder if Wiater actually thought the Turtles were people mutated into reptiles. Aside from Andresla’s Jay Leno chin, I really liked Garrett Ho’s designs for all the Amazons, especially the strawberry blonde one Emur seemed to be getting along the best with. Her 80s sweatband was hilarious-looking, but cute. There’s one major problem with this issue and its a few pages where the script and the art completely disconnect from one another. While riding in the chariots being pulled by the winged horses, the characters are going on about how and why the horses refuse to fly anymore… as the horses are clearly drawn flying across the sky with the characters in tow. By page 15, Ho seemed to realize what he was doing and suddenly the horses are trotting along the Golden Road, but that doesn’t cover-up the confusion of the previous three pages. The Donatello and Leatherhead miniseries is a rather unessential story arc, but to repeat my praise from the past two reviews, it has some very cute and energetic artwork from Ho, breathing life into a fairly dry script. I felt like there was a lot of genuinely intriguing world-building going on with the Hollow Earth; naming the various continents (or “worlds within worlds”), establishing its own history and mythology and generally forging a lot of potential. Unfortunately, none of it is ever seen again, even with Don’s promise to visit Emur someday. Well, hey, it’s not like the staff knew TMNT Adventures would be cancelled in a couple years, anyhow.